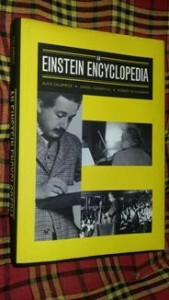 ‘An Einstein Encyclopaedia’ by Alice Calaprice, Daniel Kennefick and Robert Schulmann, published by Princeton University Press, Oxford. Einstein quit Germany and Europe and moved to the USA in 1933. He joined the Institute for Advanced Study, in Princeton, New Jersey and was part of the Institute till 1945, but had an office in the premises till he died, in 1955. It seems proper that late last year the Princeton University Press brought out a collection of facts, history, people and science, covering ‘the personal, scientific and public spheres of Einstein’s life’ to mark the centenary of his celebrated 1915 paper (educationmatters.ie/one-hundred-years-relativity). The book is a veritable museum of Einstein’s life, quite literally from his birth to his death, as well as a curating of the wide sweep of his work. About the person, the book recounts his early years, his schooling and university days, his work in the patent office, where he was ‘technical expert’, his personal life, his family, his illustrious and magnificent career, and finally an intimate account of his last days. About his career and work, the book is a swift tour of the coming of age of physics itself – the background, the foundations, which led to his famous reformulation of space and time, the extension to include the force of gravity, which is in fact a giant leap by itself, and the pivotal role of his work in all developments in science since then. Einstein’s first important work, in fact, was in clarifying ideas of the ‘quantum’, or the discrete packets in which transfer of energy took place. The discovery of the equivalence of mass and energy, soon after, led to the advances in quantum mechanics, which is the way nature behaves at very small dimensions, and the ability to manipulate atoms and molecules in a way that could not have been imagined. His work on the nature of the force of gravity, which was not merely refinement of the laws found by Newton, but was a new way of looking at mass, energy and space, led to discoveries which even Einstein could not have imagined – neutron stars, black holes, galactic dynamics, gravitational lensing, the Big Bang, the expanding universe, an entirely new understanding of cosmology, in the face of which anything before the time of Einstein is almost relegated as primitive. The book has a large division about Einstein’s colleagues and contemporaries, which reads as a Who’s Who of physics in the first half of the century. And then there is the section that describes Einstein’s role in shaping concepts in physics, time and space, simultaneity, causality, relativity and quantum mechanics, statistical mechanics. The authors are Alice Calaprice, renowned author of books on Einstein, Daniel Kennefick, professor of physics and author of books on the Theory of Relativity, and Robert Schulmann, an authority on the writings by and about Einstein. While the book is informative and full of interest for the lay reader, the book cites extensive references and sources, including an annotated bibliography, which could enthrall the specialist.